Sony Online Entertainment and LucasArts have teamed up to unveil Star Wars: Clone Wars Adventures, a new kid-friendly, free-to-play virtual world coming later this year. The new virtual world will be a "fun and safe online environment" featuring mini-games and activities, "social gatherings," numerous customization options and more. Kids can join with their friends to battle the forces of evil alongside "iconic" Star Wars characters like Anakin Skywalker, Obi-Wan Kenobi and Ahsoka Tano, while parents will be able to put limits on the action with built-in parental controls. Clone Wars Adventures will be free-to-play but monthly memberships and microtransaction options will also be available to gamers who want to "take the galactic action to the next level." "Working hand in hand with Lucasfilm, LucasArts and Sony Online Entertainment ensures that Clone Wars Adventures will be the most authentic and accessible Clone Wars experience for kids and families to play in their very own living room," said LucasArts Vice President Mary Bihr. Calling it "the ultimate destination for fans of The Clone Wars," SOE President John Smedley added, "We've worked with LucasArts and Lucasfilm to create a virtual world that is seamlessly integrated with the TV series and a true extension of the show. It's also just flat-out fun to play." All of which may be true, but I'm having trouble wrapping my head around the idea of Ahsoka Tano as an "iconic" Star Wars figure. Really, Sony? Is it fair to call a character iconic if I have to hit Google to find out who she is? Ah, but maybe I'm just old and out of touch. I'll have to ask my sister's kid if he remembers the time little Anakin crushed a dude's throat with one hand just because he was in a bad mood. 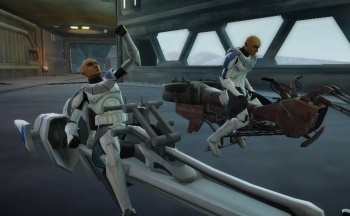 Star Wars: Clone Wars Adventures launches this fall, exclusively for the PC.